When David was in the ICU, a few weeks before his passing, he called me! What did he need? It seems that there was a Russian Jew in the ICU, a patient. Despite David's weakness and discomfort he took interest in them and saw the opportunity to help them with their yiddishkeit so he found my phone number and asked me to bring over some Russian Jewish literature! What a Shliach!! This picture was taken on 9/23/01. It was the day after my Bar Mitzvah.The rabbi was in the hospital, so he could not be there. Since there were two Cohens in the room he asked us to say a blessing. He gave me a face mask to use as a kippah and we gave him our blessing. He asked me to cover the funny picture on my shirt with a gauze pad and a piece of tape. During our lessons for the bar mitzvah, he used to pull my socks off and then I would try to pull off his. One time he got me all wet with a water gun he had and ended up giving it to me. I looked forward to our meetings, he was a great teacher and a dear friend I will never forget. On our arrival to North Miami Beach for my medical treatment at Mount Sinai after a difficult illness - alone, trying to overcome many obstacles - a knock at the door and in walks a young man with a contagious smile and a big “Shalom Aleichem” that brought a media joy to our difficult beginning. Who was this Malach and how did he know we were very much in need of a friendly welcome - Dovid Bryn zt”l made it his business to know these things, and do the kindest of deeds. It didn't end there - Dovid cared and watched over our family during the duration of our stay in Miami. He was there for us, for our children Bali & Noah through the good times and the not-so-good times. Dovid knew what to say and how to say it with the warmth that touched the heart. Dovid had a gift to reach out to every individual and make a difference. He emanated love and the world felt that. 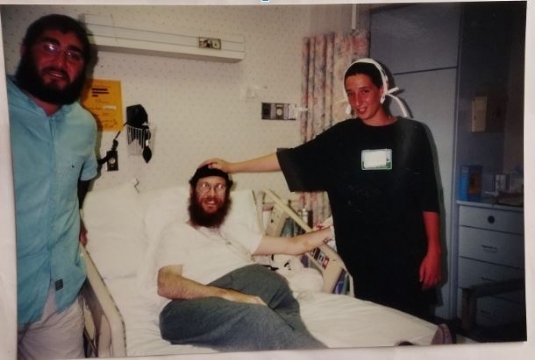 We connected, as did every soul who met Dovid - we are still connected and will always remain connected to the special Neshama of Dovid Bryn zt”l. Micha & Bracha Peled, Inbal, Noah, & families. His easy laugh and the twinkles behind the thick glasses. Rabbi Bryn: " I really wanted my Autistic Son to have a Bar Mitzvah. Rabbi Bryn made it happen- it was real - it was wonderful and it made a centuries old tradition available for my jewish male,who got to become a jewish man. I was so proud of my son and my religion and will always be grateful to Rabbi Bryn for what he gave me and my son"